ZANAFLEX CAPSULES® ARE NOT BIOEQUIVALENT TO ZANAFLEX® TABLETS IN THE FED STATE. THE PRESCRIBER SHOULD BE THOROUGHLY FAMILIAR WITH THE COMPLEX EFFECTS OF FOOD ON TIZANIDINE PHARMACOKINETICS (see PHARMACOKINETICS and DOSAGE AND ADMINISTRATION). Zanaflex Capsules® are supplied as 2, 4, and 6 mg capsules and Zanaflex® tablets are supplied as 4 mg tablets for oral administration. 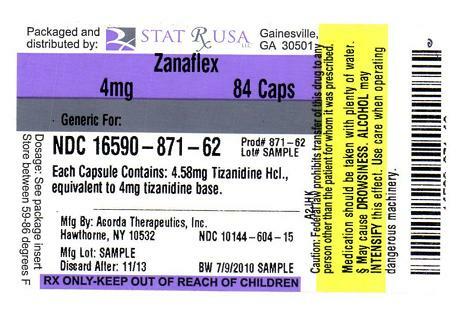 Zanaflex Capsules® are composed of the active ingredient, tizanidine hydrochloride (2.29 mg equivalent to 2 mg tizanidine base, 4.58 mg equivalent to 4 mg tizanidine base, and 6.87 mg equivalent to 6 mg tizanidine base), and the inactive ingredients, hydroxypropyl methyl cellulose, silicon dioxide, sugar spheres, titanium dioxide, gelatin, and colorants. Zanaflex® tablets are composed of the active ingredient, tizanidine hydrochloride (4.58 mg equivalent to 4 mg tizanidine base), and the inactive ingredients, silicon dioxide colloidal, stearic acid, microcrystalline cellulose and anhydrous lactose. Tizanidine is an agonist at Î±2-adrenergic receptor sites and presumably reduces spasticity by increasing presynaptic inhibition of motor neurons. In animal models, tizanidine has no direct effect on skeletal muscle fibers or the neuromuscular junction, and no major effect on monosynaptic spinal reflexes. The effects of tizanidine are greatest on polysynaptic pathways. The overall effect of these actions is thought to reduce facilitation of spinal motor neurons. The imidazoline chemical structure of tizanidine is related to that of the anti-hypertensive drug clonidine and other Î±2-adrenergic agonists. Pharmacological studies in animals show similarities between the two compounds, but tizanidine was found to have one-tenth to one-fiftieth (1/50) of the potency of clonidine in lowering blood pressure. Tizanidine has linear pharmacokinetics over a dose of 1 to 20 mg. Tizanidine has a half-life of approximately 2.5 hours (CV=33%). Approximately 95% of an administered dose is metabolized. The primary cytochrome P450 isoenzyme involved in tizanidine metabolism is CYP1A2. 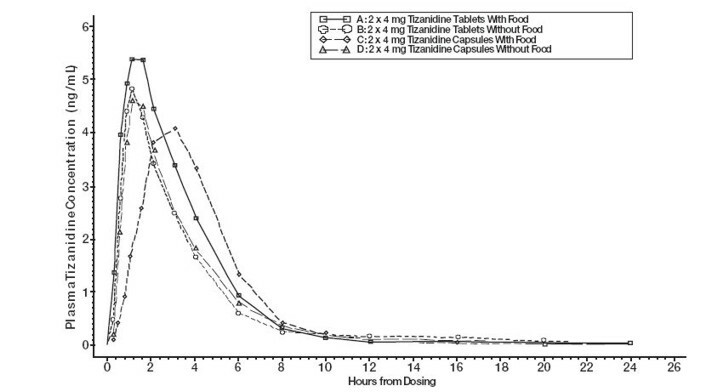 Tizanidine metabolites are not known to be active; their half-lives range from 20 to 40 hours. Zanaflex Capsules® and Zanaflex® tablets are bioequivalent to each other under fast conditions, but not under fed conditions. A single dose of either two 4 mg tablets or two 4 mg capsules was administered under fed and fasting conditions in an open label, four period, randomized crossover study in 96 human volunteers, of whom 81 were eligible for the statistical analysis. Following oral administration of either the tablet or capsule (in the fasted state), tizanidine has peak plasma concentrations occurring 1.0 hours after dosing with a half-life of approximately 2 hours. When two 4 mg tablets are administered with food the mean maximal plasma concentration is increased by approximately 30%, and the median time to peak plasma concentration is increased by 25 minutes, to 1 hour and 25 minutes. In contrast, when two 4 mg capsules are administered with food the mean maximal plasma concentration is decreased by 20%, the median time to peak plasma concentration is increased by 2 hours to 3 hours. Consequently, the mean Cmax for the capsule when administered with food is approximately 2/3's the Cmax for the tablet when administered with food. Food also increases the extent of absorption for both the tablets and capsules. The increase with the tablet (~30%) is significantly greater than with the capsule (~10%). Consequently when each is administered with food, the amount absorbed from the capsule is about 80% of the amount absorbed from the tablet (see Figure 1). Administration of the capsule contents sprinkled on applesauce is not bioequivalent to administration of an intact capsule under fasting conditions. Administration of the capsule contents on applesauce results in a 15% - 20% increase in Cmax and AUC of tizanidine compared to administration of an intact capsule while fasting, and a 15 minute decrease in the median lag time and time to peak concentration. No specific pharmacokinetic study was conducted to investigate age effects. Cross study comparison of pharmacokinetic data following single dose administration of 6 mg tizanidine showed that younger subjects cleared the drug four times faster than the elderly subjects. Tizanidine has not been evaluated in children (see PRECAUTIONS). The influence of hepatic impairment on the pharmacokinetics of tizanidine has not been evaluated. Because tizanidine is extensively metabolized in the liver, hepatic impairment would be expected to have significant effects on pharmacokinetics of tizanidine. Tizanidine should ordinarily be avoided or used with extreme caution in this patient population (see WARNINGS). Tizanidine clearance is reduced by more than 50% in elderly patients with renal insufficiency (creatinine clearance less than 25 mL/min) compared to healthy elderly subjects; this would be expected to lead to a longer duration of clinical effect. Tizanidine should be used with caution in renally impaired patients (see PRECAUTIONS). No specific pharmacokinetic study was conducted to investigate gender effects. Retrospective analysis of pharmacokinetic data, however, following single and multiple dose administration of 4 mg tizanidine showed that gender had no effect on the pharmacokinetics of tizanidine. The interaction between tizanidine and either fluvoxamine or ciprofloxacin is most likely due to inhibition of CYP1A2 by fluvoxamine or ciprofloxacin. Although there have been no clinical studies evaluating the effects of other CYP1A2 inhibitors on tizanidine, other CYP1A2 inhibitors, such as zileuton, other fluoroquinolones, antiarrythmics (amiodarone, mexiletine, propafenone and verapamil), cimetidine, famotidine oral contraceptives, acyclovir and ticlopidine, may also lead to substantial increases in tizanidine blood concentrations (see WARNINGS). No specific pharmacokinetic study was conducted to investigate interaction between oral contraceptives and tizanidine. Retrospective analysis of population pharmacokinetic data following single and multiple dose administration of 4 mg tizanidine, however, showed that women concurrently taking oral contraceptives had 50% lower clearance of tizanidine compared to women not on oral contraceptives (see PRECAUTIONS). Tizanidine's capacity to reduce increased muscle tone associated with spasticity was demonstrated in two adequate and well controlled studies in patients with multiple sclerosis or spinal cord injury. In one study, patients with multiple sclerosis were randomized to receive single oral doses of drug or placebo. Patients and assessors were blind to treatment assignment and efforts were made to reduce the likelihood that assessors would become aware indirectly of treatment assignment (e.g., they did not provide direct care to patients and were prohibited from asking questions about side effects). In all, 140 patients received either placebo, 8 mg or 16 mg of tizanidine. Response was assessed by physical examination; muscle tone was rated on a 5 point scale (Ashworth score), with a score of 0 used to describe normal muscle tone. A score of 1 indicated a slight spastic catch while a score of 2 indicated more marked muscle resistance. A score of 3 was used to describe considerable increase in tone, making passive movement difficult. A muscle immobilized by spasticity was given a score of 4. Spasm counts were also collected. Assessments were made at 1, 2, 3 and 6 hours after treatment. A statistically significant reduction of the Ashworth score for Zanaflex compared to placebo was detected at 1, 2 and 3 hours after treatment. Figure 2 below shows a comparison of the mean change in muscle tone from baseline as measured by the Ashworth scale. The greatest reduction in muscle tone was 1 to 2 hours after treatment. By 6 hours after treatment, muscle tone in the 8 and 16 mg tizanidine groups was indistinguishable from muscle tone in placebo treated patients. Within a given patient, improvement in muscle tone was correlated with plasma concentration. Plasma concentrations were variable from patient to patient at a given dose. Although 16 mg produced a larger effect, adverse events including hypotension were more common and more severe than in the 8 mg group. There were no differences in the number of spasms occurring in each group. In a multiple dose study, 118 patients with spasticity secondary to spinal cord injury were randomized to either placebo or tizanidine. Steps similar to those taken in the first study were employed to ensure the integrity of blinding. 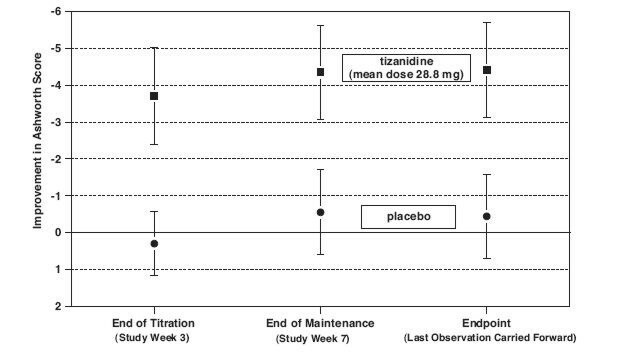 At endpoint (the protocol-specified time of outcome assessment), there was a statistically significant reduction in muscle tone and frequency of spasms in the tizanidine treated group compared to placebo. The reduction in muscle tone was not associated with a reduction in muscle strength (a desirable outcome) but also did not lead to any consistent advantage of tizanidine treated patients on measures of activities of daily living. Figure 3 below shows a comparison of the mean change in muscle tone from baseline as measured by the Ashworth scale. Tizanidine is a short-acting drug for the management of spasticity. Because of the short duration of effect, treatment with tizanidine should be reserved for those daily activities and times when relief of spasticity is most important (see DOSAGE AND ADMINISTRATION). Concomitant use of tizanidine with fluvoxamine or with ciprofloxacin, potent inhibitors of CYP1A2, is contraindicated. Significant alterations of pharmacokinetic parameters of tizanidine including increased AUC, t1/2, Cmax, increased oral bioavailability and decreased plasma clearance have been observed with concomitant administration of either fluvoxamine or ciprofloxacin. This pharmacokinetic interaction can result in potentially serious adverse events (See WARNINGS and CLINICAL PHARMACOLOGY: Drug Interactions). Zanaflex is contraindicated in patients with known hypersensitivity to Zanaflex or its ingredients. Clinical experience with long-term use of tizanidine at doses of 8 to 16 mg single doses or total daily doses of 24 to 36 mg (see DOSAGE AND ADMINISTRATION) is limited. In safety studies, approximately 75 patients have been exposed to individual doses of 12 mg or more for at least one year or more and approximately 80 patients have been exposed to total daily doses of 30 to 36 mg/day for at least one year or more. There is essentially no long-term experience with single, daytime doses of 16 mg. Because long-term clinical study experience at high doses is limited, only those adverse events with a relatively high incidence are likely to have been identified (see WARNINGS, PRECAUTIONS and ADVERSE REACTIONS). 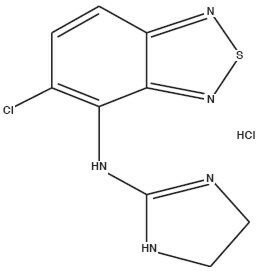 Tizanidine is an Î±2-adrenergic agonist (like clonidine) and can produce hypotension. In a single dose study where blood pressure was monitored closely after dosing, two-thirds of patients treated with 8 mg of tizanidine had a 20% reduction in either the diastolic or systolic BP. The reduction was seen within 1 hour after dosing, peaked 2 to 3 hours after dosing and was associated, at times, with bradycardia, orthostatic hypotension, lightheadedness/dizziness and rarely syncope. The hypotensive effect is dose related and has been measured following single doses of â‰¥ 2 mg. The chance of significant hypotension may possibly be minimized by titration of the dose and by focusing attention on signs and symptoms of hypotension prior to dose advancement. In addition, patients moving from a supine to fixed upright position may be at increased risk for hypotension and orthostatic effects. Caution is advised when tizanidine is to be used in patients receiving concurrent antihypertensive therapy and should not be used with other Î±2-adrenergic agonists. Clinically significant hypotension (decreases in both systolic and diastolic pressure) has been reported with concomitant administration of either fluvoxamine or ciprofloxacin and single doses of 4 mg of tizanidine. Therefore, concomitant use of tizanidine with fluvoxamine or with ciprofloxacin, potent inhibitors of CYP1A2, is contraindicated (see CONTRAINDICATIONS and CLINICAL PHARMACOLOGY: Drug Interactions). Tizanidine occasionally causes liver injury, most often hepatocellular in type. In controlled clinical studies, approximately 5% of patients treated with tizanidine had elevations of liver function tests (ALT/SGPT, AST/SGOT) to greater than 3 times the upper limit of normal (or 2 times if baseline levels were elevated) compared to 0.4% in the control patients. Most cases resolved rapidly upon drug withdrawal with no reported residual problems. In occasional symptomatic cases, nausea, vomiting, anorexia and jaundice have been reported. Based upon postmarketing experience, death associated with liver failure has been a rare occurrence reported in patients treated with tizanidine. Monitoring of aminotransferase levels is recommended during the first 6 months of treatment (e.g., baseline, 1, 3 and 6 months) and periodically thereafter, based on clinical status. Because of the potential toxic hepatic effect of tizanidine, the drug should ordinarily be avoided or used with extreme caution in patients with impaired hepatic function. In the multiple dose, controlled clinical studies, 48% of patients receiving any dose of tizanidine reported sedation as an adverse event. In 10% of these cases, the sedation was rated as severe compared to less than 1% in the placebo treated patients. Sedation may interfere with everyday activity. The effect appears to be dose related. In a single dose study, 92% of the patients receiving 16 mg, when asked, reported that they were drowsy during the 6 hour study. This compares to 76% of the patients on 8 mg and 35% of the patients on placebo. Patients began noting this effect 30 minutes following dosing. The effect peaked 1.5 hours following dosing. Of the patients who received a single dose of 16 mg, 51% continued to report drowsiness 6 hours following dosing compared to 13% in the patients receiving placebo or 8 mg of tizanidine. In the multiple dose studies, the prevalence of patients with sedation peaked following the first week of titration and then remained stable for the duration of the maintenance phase of the study. Tizanidine use has been associated with hallucinations. Formed, visual hallucinations or delusions have been reported in 5 of 170 patients (3%) in two North American controlled clinical studies. These 5 cases occurred within the first 6 weeks. Most of the patients were aware that the events were unreal. One patient developed psychoses in association with the hallucinations. One patient among these 5 continued to have problems for at least 2 weeks following discontinuation of tizanidine. The influence of hepatic impairment on the pharmacokinetics of tizanidine has not been evaluated. Because tizanidine is extensively metabolized in the liver, hepatic impairment would be expected to have significant effects on the pharmacokinetics of tizanidine. Tizanidine should ordinarily be avoided or used with extreme caution in patients with hepatic impairment (see also RISK OF LIVER INJURY). In a pharmacokinetic study, tizanidine serum concentration was significantly increased (Cmax 7-fold, AUC 10-fold) when the drug was given concomitantly with ciprofloxacin. Potentiated hypotensive and sedative effects were observed. Ciprofloxacin and tizanidine should not be used together (see CONTRAINDICATIONS and CLINICAL PHARMACOLOGY: Drug Interactions). Because of potential drug interactions, concomitant use of tizanidine with other CYP1A2 inhibitors, such as zileuton, other fluoroquinolones, antiarrythmics (amiodarone, mexiletine, propafenone, and verapamil), cimetidine, famotidine, oral contraceptives, acyclovir and ticlopidine (see CLINICAL PHARMACOLOGY: Drug Interactions) should ordinarily be avoided. If their use is clinically necessary, they should be used with caution. Prolongation of the QT interval and bradycardia were noted in chronic toxicity studies in dogs at doses equal to the maximum human dose on a mg/m2 basis. ECG evaluation was not performed in the controlled clinical studies. Reduction in pulse rate has been noted in association with decreases in blood pressure in the single dose controlled study (see WARNINGS). Dose-related retinal degeneration and corneal opacities have been found in animal studies at doses equivalent to approximately the maximum recommended dose on a mg/m2 basis. There have been no reports of corneal opacities or retinal degeneration in the clinical studies. Tizanidine should be used with caution in patients with renal insufficiency (creatinine clearance less than 25 mL/min), as clearance is reduced by more than 50%. In these patients, during titration, the individual doses should be reduced. If higher doses are required, individual doses rather than dosing frequency should be increased. These patients should be monitored closely for the onset or increase in severity of the common adverse events (dry mouth, somnolence, asthenia and dizziness) as indicators of potential overdose. Because drug interaction studies of tizanidine with oral contraceptives have shown that concomitant use may reduce the clearance of tizanidine by as much as 50%, concomitant use of tizanidine with oral contraceptives should ordinarily be avoided (see CLINICAL PHARMACOLOGY: Drug Interactions). However, if concomitant use is clinically necessary, the starting dose and subsequent titration rate of tizanidine should be reduced. If therapy needs to be discontinued, particularly in patients who have been receiving high doses for long periods, the dose should be decreased slowly to minimize the risk of withdrawal and rebound hypertension, tachycardia, and hypertonia. Patients should be advised of the limited clinical experience with tizanidine both in regard to duration of use and the higher doses required to reduce muscle tone (see WARNINGS). Because of the possibility of tizanidine lowering blood pressure, patients should be warned about the risk of clinically significant orthostatic hypotension (see WARNINGS). Because of the possibility of sedation, patients should be warned about performing activities requiring alertness, such as driving a vehicle or operating machinery (see WARNINGS). Patients should also be instructed that the sedation may be additive when tizanidine is taken in conjunction with drugs (baclofen, benzodiazepines) or substances (e.g., alcohol) that act as CNS depressants. Patients should be advised of the change in the absorption profile of tizanidine if taken with food and the potential changes in efficacy and adverse effect profiles that may result (see CLINICAL PHARMACOLOGY: Pharmacokinetics). Patients should be advised not to stop tizanidine suddenly as rebound hypertension and tachycardia may occur (see PRECAUTIONS: Discontinuing Therapy). Tizanidine should be used with caution where spasticity is utilized to sustain posture and balance in locomotion or whenever spasticity is utilized to obtain increased function. Because of the potential for the increased risk of serious adverse reactions including severe lowering of blood pressure and sedation when tizanidine and either fluvoxamine or ciprofloxacin are used together, tizanidine should not be used with either fluvoxamine or ciprofloxacin. Because of the potential for interaction with other CYP1A2 inhibitors, patients should be instructed to inform their physicians and pharmacists when any medication is added or removed from their regimen. The interaction between tizanidine and either fluvoxamine or ciprofloxacin is most likely due to inhibition of CYP1A2 by fluvoxamine or ciprofloxacin. Although there have been no clinical studies evaluating the effects of other CYP1A2 inhibitors on tizanidine, other CYP1A2 inhibitors, including zileuton, other fluroquinolones, antiarrythmics (amiodarone, mexiletine, propafenone, and verapamil), cimetidine and famotidine, oral contraceptives, acyclovir, and ticlopidine may also lead to substantial increases in tizanidine blood concentrations. Concomitant use of tizanidine with CYP1A2 inhibitors should ordinarily be avoided. If their use is clinically necessary, they should be used with caution (see WARNINGS). No specific pharmacokinetic study was conducted to investigate interaction between oral contraceptives and tizanidine, but retrospective analysis of population pharmacokinetic data following single and multiple dose administration of 4 mg tizanidine showed that women concurrently taking oral contraceptives had 50% lower clearance of tizanidine that women not on oral contraceptives. No evidence for carcinogenicity was seen in two dietary studies in rodents. Tizanidine was administered to mice for 78 weeks at doses up to 16 mg/kg, which is equivalent to 2 times the maximum recommended human dose on a mg/m2 basis. Tizanidine was also administered to rats for 104 weeks at doses up to 9 mg/kg, which is equivalent to 2.5 times the maximum recommended human dose on a mg/m2 basis. There was no statistically significant increase in tumors in either species. Tizanidine was not mutagenic or clastogenic in the following in vitro assays: the bacterial Ames test and the mammalian gene mutation test and chromosomal aberration test in Chinese hamster cells. It was also negative in the following in vivo assays: the bone marrow micronucleus test in mice, the bone marrow micronucleus and cytogenicity test in Chinese hamsters, the dominant lethal mutagenicity test in mice, and the unscheduled DNA synthesis (UDS) test in mice. Tizanidine did not affect fertility in male rats at doses of 10 mg/kg, approximately 2.7 times the maximum recommended human dose on a mg/m2 basis, and in females at doses of 3 mg/kg, approximately equal to the maximum recommended human dose on a mg/m2 basis; fertility was reduced in males receiving 30 mg/kg (8 times the maximum recommended human dose on a mg/m2 basis) and in females receiving 10 mg/kg (2.7 times the maximum recommended human dose on a mg/m2 basis). At these doses, maternal behavioral effects and clinical signs were observed including marked sedation, weight loss, and ataxia. Reproduction studies performed in rats at a dose of 3 mg/kg, equal to the maximum recommended human dose on a mg/m2 basis, and in rabbits at 30 mg/kg, 16 times the maximum recommended human dose on a mg/m2 basis, did not show evidence of teratogenicity. Tizanidine at doses that are equal to and up to 8 times the maximum recommended human dose on a mg/m2 basis increased gestation duration in rats. Prenatal and postnatal pup loss was increased and developmental retardation occurred. Post-implantation loss was increased in rabbits at doses of 1 mg/kg or greater, equal to or greater than 0.5 times the maximum recommended human dose on a mg/m2 basis. Tizanidine has not been studied in pregnant women. Tizanidine should be given to pregnant women only if clearly needed. The effect of tizanidine on labor and delivery in humans is unknown. It is not known whether tizanidine is excreted in human milk, although as a lipid soluble drug, it might be expected to pass into breast milk. Tizanidine should be used with caution in elderly patients because clearance is decreased four-fold. There are no adequate and well-controlled studies to document the safety and efficacy of tizanidine in children. In multiple dose, placebo-controlled clinical studies, 264 patients were treated with tizanidine and 261 with placebo. Adverse events, including severe adverse events, were more frequently reported with tizanidine than with placebo. Forty-five of 264 (17%) patients receiving tizanidine and 13 of 261 (5%) of patients receiving placebo in three multiple dose, placebo-controlled clinical studies, discontinued treatment for adverse events. When patients withdrew from the study, they frequently had more than one reason for discontinuing. The adverse events most frequently leading to withdrawal of tizanidine treated patients in the controlled clinical studies were asthenia (weakness, fatigue and/or tiredness) (3%), somnolence (3%), dry mouth (3%), increased spasm or tone (2%), and dizziness (2%). In multiple dose, placebo-controlled clinical studies involving 264 patients with spasticity, the most frequent adverse effects were dry mouth, somnolence/sedation, asthenia (weakness, fatigue and/or tiredness) and dizziness. Three-quarters of the patients rated the events as mild to moderate and one-quarter of the patients rated the events as being severe. These events appeared to be dose related. The events cited reflect experience gained under closely monitored conditions of clinical studies in a highly selected patient population. In actual clinical practice or in other clinical studies, these frequency estimates may not apply, as the conditions of use, reporting behavior, and the kinds of patients treated may differ. Table 1 lists treatment emergent signs and symptoms that were reported in greater than 2% of patients in three multiple dose, placebo-controlled studies who received tizanidine where the frequency in the tizanidine group was at least as common as in the placebo group. These events are not necessarily related to tizanidine treatment. For comparison purposes, the corresponding frequency of the event (per 100 patients) among placebo treated patients is also provided. In the single dose, placebo-controlled study involving 142 patients with spasticity, the patients were specifically asked if they had experienced any of the four most common adverse events: dry mouth, somnolence (drowsiness), asthenia (weakness, fatigue and/or tiredness) and dizziness. In addition, hypotension and bradycardia were observed. The occurrence of these adverse effects is summarized in Table 2. Other events were, in general, reported at a rate of 2% or less. Tizanidine was administered to 1385 patients in additional clinical studies where adverse event information was available. The conditions and duration of exposure varied greatly, and included (in overlapping categories) double-blind and open-label studies, uncontrolled and controlled studies, inpatient and outpatient studies, and titration studies. Untoward events associated with this exposure were recorded by clinical investigators using terminology of their own choosing. Consequently, it is not possible to provide a meaningful estimate of the proportion of individuals experiencing adverse events without first grouping similar types of untoward events into a smaller number of standardized event categories. In the tabulations that follow, reported adverse events were classified using a standard COSTART-based dictionary terminology. The frequencies presented, therefore, represent the proportion of the 1385 patients exposed to tizanidine who experienced an event of the type cited on at least one occasion while receiving tizanidine. All reported events are included except those already listed in Table 1. If the COSTART term for an event was so general as to be uninformative, it was replaced by a more informative term. It is important to emphasize that, although the events reported occurred during treatment with tizanidine, they were not necessarily caused by it. Events are further categorized by body system and listed in order of decreasing frequency according to the following definitions: frequent adverse events are those occurring on one or more occasions in at least 1/100 patients (only those not already listed in the tabulated results from placebo-controlled studies appear in this listing); infrequent adverse events are those occurring in 1/100 to 1/1000 patients; rare adverse events are those occurring in fewer than 1/1000 patients. Abuse potential was not evaluated in human studies. Rats were able to distinguish tizanidine from saline in a standard discrimination paradigm, after training, but failed to generalize the effects of morphine, cocaine, diazepam, or phenobarbital to tizanidine. Monkeys were shown to self-administer tizanidine in a dose-dependent manner, and abrupt cessation of tizanidine produced transient signs of withdrawal at doses > 35 times the maximum recommended human dose on a mg/m2 basis. These transient withdrawal signs (increased locomotion, body twitching, and aversive behavior toward the observer) were not reversed by naloxone administration. Tizanidine is closely related to clonidine, which is often abused in combination with narcotics and is known to cause symptoms of rebound upon abrupt withdrawal. Three cases of rebound symptoms on sudden withdrawal of tizanidine have been reported. The case reports suggest that these patients were also misusing narcotics. Withdrawal symptoms included hypertension, tachycardia, hypertonia, tremor, and anxiety. As with clonidine, withdrawal is expected to be more likely in cases where high doses are used, especially for prolonged periods. A review of the safety surveillance database revealed cases of intentional and accidental tizanidine overdose. Some of the cases resulted in fatality and many of the intentional overdoses were with multiple drugs including CNS depressants. The clinical manifestations of tizanidine overdose were consistent with its known pharmacology. In the majority of cases a decrease in sensorium was observed including lethargy, somnolence, confusion and coma. Depressed cardiac function are also observed including most often bradycardia and hypotension. Respiratory depression is another common feature of tizanidine overdose. Should overdose occur, basic steps to ensure the adequacy of an airway and the monitoring of cardiovascular and respiratory systems should be undertaken. In general, symptoms resolve within one to three days following discontinuation of tizanidine and administration of appropriate therapy. Due to the similar mechanism of action, symptoms and management of tizanidine overdose are similar to those following clonidine overdose. For the most recent information concerning the management of overdose, contact a poison control center. Experience with single doses exceeding 8 mg and daily doses exceeding 24 mg is limited. There is essentially no experience with repeated, single, daytime doses greater than 12 mg or total daily doses greater than 36 mg (see WARNINGS). Food has complex effects on tizanidine pharmacokinetics, which differ with the different formulations. These pharmacokinetic differences may result in clinically significant differences when  switching administration of the tablet between the fed or fasted state,  switching administration of the capsule between the fed or fasted state,  switching between the tablet and capsule in the fed state, or  switching between the intact capsule and sprinkling the contents of the capsule on applesauce. These changes may result in increased adverse events or delayed/more rapid onset of activity, depending upon the nature of the switch. For this reason, the prescriber should be thoroughly familiar with the changes in kinetics associated with these different conditions (see CLINICAL PHARMACOLOGY: Pharmacokinetics). 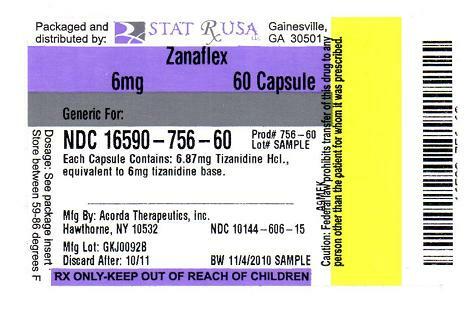 Zanaflex® is the registered trademark of Acorda Therapeutics, Inc. Zanaflex Capsules® is the trademark of Acorda Therapeutics, Inc.
©2008, Acorda Therapeutics, Inc., All rights reserved.